Reading at hyper speed – if you are a geologist! There is a small potted tree upstairs on the bridge deck and an orchid plant that I sit next to just to see something green. We are a little less than a week in to this expedition and this has become my favorite place on the ship. It is reassuring to see dirt and roots and leaves when all that is around you is ocean and sky. I will admit that I prefer living organisms to rocks. In reflection, maybe that is not something I should mention while on a boat full of geologists. At least not repeatedly or in something like a blog…oops. They do not study living organisms on this ship but there is an organic geochemist who studies compounds created by living creatures that have been mushed and decayed into something unrecognizable as life but are currently highly sought after as fossil fuels, oils and gases, and that can tell us a great deal about the climate on earth at different time periods among other things (want to know more? geochemistry specific blog coming soon send me your questions!). There is also, what is becoming my second favorite place on the ship, a lab where they study what was once living in the ocean that has been well preserved as fossils, the Paleontology lab. What lies in the sediments and rocks below the sea floor are the greatest fossil records on earth and their layers can be read like a book as I mentioned in my previous post. In the Paleontology lab they have rows of microscopes and a large sink and fume hood area for processing samples. First they must wash the samples through a micro filtering sieve to capture ancient life that they have found below the sea floor. To prepare the fossils for viewing they only need to dip the tip of a toothpick in the sample and smear it on a glass slide. They then look at these fossils under the microscope and identify the thousands of species known to determine the age of the sediment and also what the climate was like and the depth of the ocean at the time. 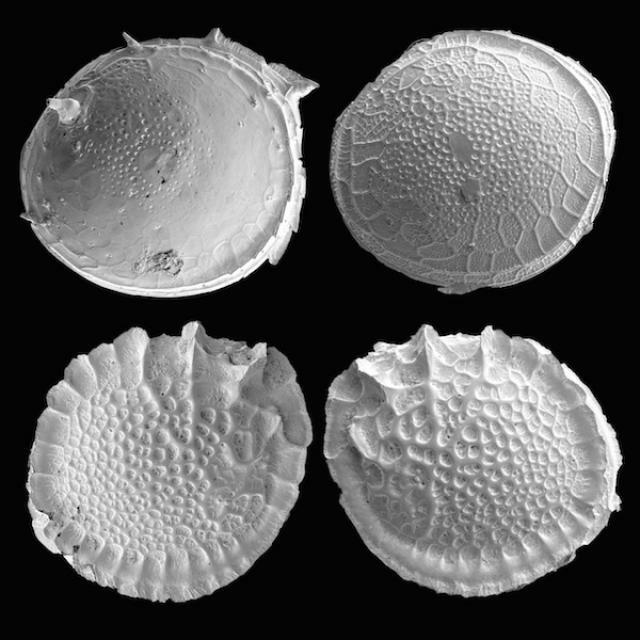 They call them microfossils and they are beautiful! “When people think of fossils they often think of big ones like dinosaurs. They think of the Mesozoic Era, a time period roughly 250-65 million years ago. They might also think of the Pleistocene epoch (11.7 to 2.6 million years ago) which conjures up images of wooly mammoths roaming an icy land after dinosaurs went extinct. 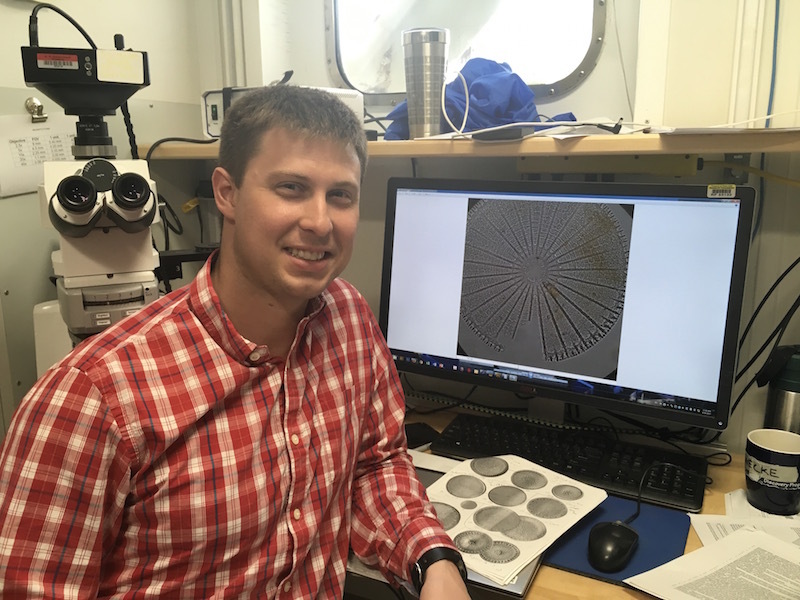 Like the fossilized remains of dinosaurs and wooly mammoths that indicate a certain time period in the past, tiny fossils of microscopic marine organisms help scientists determine the age of rock, and with great resolution. These microsfossils are essential in helping the geology team of scientist here on the JOIDES Resolution estimate the age of the sediment layers they are pulling up. This claim for the age of the sediment is also cross examined with other studies of known sediment layers as well as the readings from the Paleomagnetics lab. This is not something they have willy nilly come to a conclusion on. The research behind these claims are supported by thousands of studies from hundreds of sites around the world!